This is a foreign exchange guide to Vatican City, the Euro currency plus EUR transfers and travel tips. It might only cover about half a square kilometre, but the Vatican looks every inch a religious superpower. Its holy buildings are monumental in scale and its lavishly-decorated halls house some of the world’s most celebrated artworks. 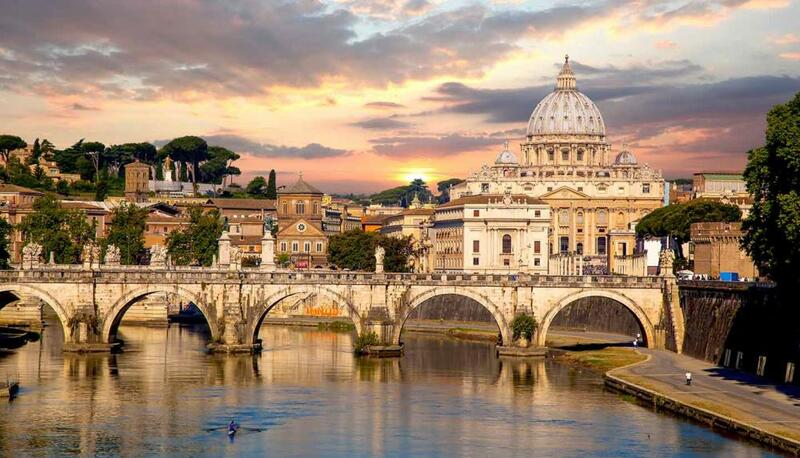 The actual Vatican is very small, a few buildings, but its meaning is global. Whatever it means to you, it is worth seeing. You don't need a tour, you can walk in and see it all, stunning architecture, and the awe of centuries of faith. Just, if you aren't up for a very hard climb and you want to see the view of Rome from the top, it can be a claustrophobic climb. Take the lift when you if you plan to see Rome from the top the Vatican. The climb to the lovely view at the top can be hard, and not very pleasant. The lift, however, can take you you up to one of the most amazing views of the city. Expect it to be crowded. Always expect a very long queue (30 mins minimum) as the queues are long every day. Rome is an expensive place to stay, but if you look around the internet you can can find good bargains. It is well worth looking around, you can find amazing places cheaper than most with a bit of effort. Start early at the Vatican Museums. This colossal museum complex occupies the 5.5-hectare Palazzo Apostolico Vaticano and contains one of the world’s greatest art collections, culminating in the Michelangelo-decorated Sistine Chapel. There are kilometres of galleries to explore, with everything from Egyptian mummies and Etruscan bronzes to classical sculptures, cartographic tapestries and Renaissance canvases. The Stanze di Rafaello (Raphael Rooms) will stop you in your tracks as you pause to marvel at the Renaissance maestro’s amazingly detailed frescoes. The Vatican Museums’ star attraction, the Sistine Chapel boasts two of the world’s greatest masterpieces: Michelangelo’s ceiling frescoes (1508-1512) and his Giudizio Universale (Last Judgment; 1535–1541). For the best views of the ceiling design, which covers 800 square metres and depicts episodes from the Old Testament, cross to the chapel’s main entrance in the east wall (opposite the visitor entrance). Entering St Peter’s Basilica for the first time is an unforgettable experience. The size and opulence of the cavernous 187m-long interior are breathtaking to behold, and wherever you look your gaze falls on yet another priceless masterpiece. One of the basilica’s most celebrated works is Michelangelo’s Pietà, a moving sculpture of the Madonna cradling her lost son near the main entrance. When searching around for information on how to get a good exchange rate when sending money to Vatican City you need to start with finding out the latest Euro foreign-transfer exchange rate. Once your funds are received by the provider the converted EUR amount will be transfered to the recipient account you specify in Vatican City.